I was baptized at the Easter Vigil liturgy at St. Martin-in-the-Field’s Episcopal Church in Columbia, SC when I was 17 years old. As part of my preparation, I remember the rector at the time suggesting that I attend and participate in all the Holy Week liturgies they offered. Looking back 32 years, I’ll be honest, I don’t remember anything particular about the Good Friday service. But I do believe the fullness of those experiences that week rooted in me a love for how we tell and live into the Passion narrative through our liturgy. We have tried to cultivate in our own family both the importance of Holy Week and a love for the experiences that come with it. The Maundy Thursday footwashing is a family favorite, particularly for my son in how it connects with his experiences at our Diocesan “Happening” retreat, which includes a powerful footwashing liturgy. Using that as leverage, there is a built-in teaching moment that Maundy Thursday is just a portion of the Triduum and thus intimately connected with Good Friday (and ultimately Easter). The death of Jesus is not an easy topic to discuss with children, and many can have anxiety around that. 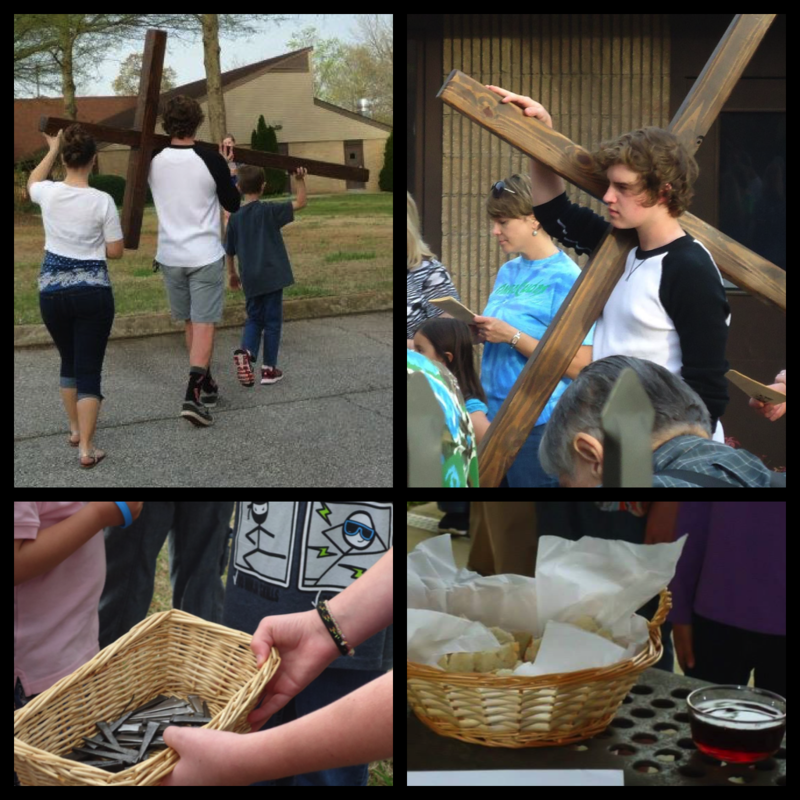 At my previous parish, St. Peter’s in Greenville, SC, we offered an interactive stations of the cross liturgy on Good Friday: the Way of the Cross for Children and Families. Adapted from the “Way of the Cross” in the Book of Occasional Services, my friend and mentor, the Rev. Furman Buchanan, developed this simple, beautiful, and age appropriate liturgy for children and families to engage the drama of Christ’s Passion and death. Of course, folks of all ages were welcome to attend and many did. 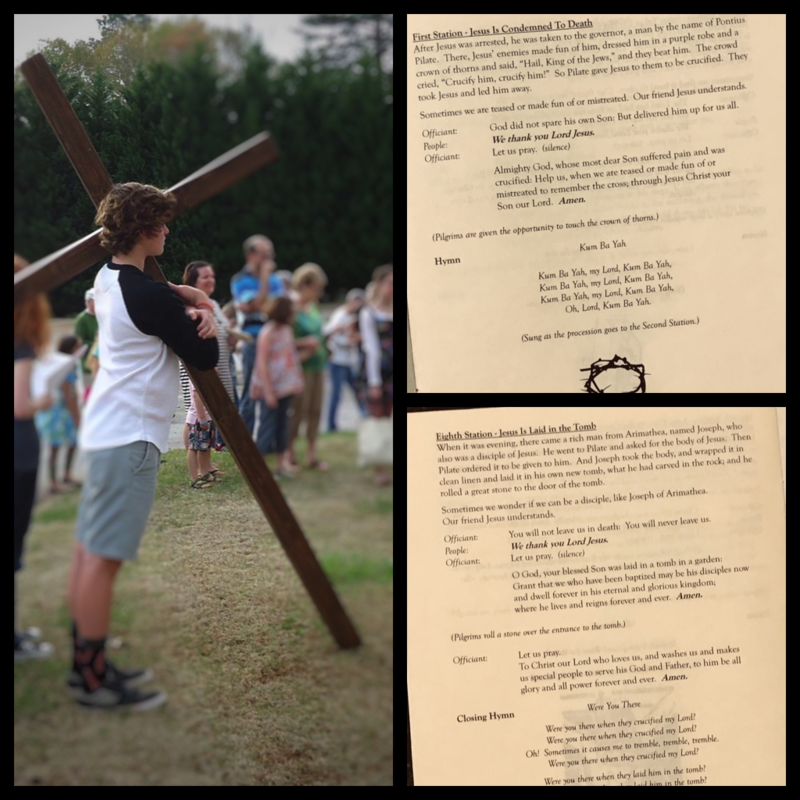 The Way of the Cross includes an opening devotion and eight stations. We would gather at the front of the church, and the stations are set up around the church grounds so that we would journey together to each station. It is very much a pilgrimage experience. The stations are led by middle and high school youth. They read reflections and help facilitate the interactive portion of their station. The stations engage the senses: they touch a crown of thorns, the group carries a large cross together, they hear women weeping and grieving for Jesus, taste vinegar (sour wine) with bread, receive a nail, hear a large bell toll to signify the death of Jesus, and then finally the kids help roll a large cardboard stone in front of a big refrigerator-box tomb. Music is an important facet of the Way of the Cross. It opens, closes, and provides the connectivity during the movement between stations. Songs and hymns have been sung acapella, and guitars have been used for accompaniment. We open with something familiar for the younger kiddos, like “Jesus Loves the Little Children”. The traveling music has most often been “Kum Ba Yah”. It is familiar, easy for little kiddos, and repetitive. Many other Taizé or children’s songs would work as long as there is a sense of reverence held. The closing hymn is #172 in the Hymnal (verses 1 & 4): “Were you there when they crucified my Lord?” Afterwards, we gather for a light reception, offering space and time to answer questions and reflect on what was experienced. I truly believe this liturgy has been an experience that provides entry points for parents to discuss the more difficult realities of Good Friday with their kiddos. Instead of focusing too much on what exactly Jesus experienced, I often shift the conversation to the ways in which Good Friday displays how God in Christ relates to humans in and through suffering. Further, one can make the explicit connection to the Annunciation, the Nativity story, and Jesus being named Emmanuel, God with us. I will ask kids what the word suffering means to them, bringing it to their level, and they usually talk about fear, illness, and those sorts of themes. We know God loves us and cares for us because of what God in Christ experienced on Good Friday. Another point I have made with my children is that we experience Good Friday through the lens of Easter and how this impacts the way we see death. Our burial liturgies hold the tension between joy and grief. Joy in celebration of our love for that person and joy in God’s promise that we will never be separated from the love of God. Grief in our sorrow for when we are parted by death from those we love. This is the reality we experience for Jesus on Good Friday. While we don’t want to look too quickly towards Easter, I believe that keeping the lens broader is more appropriate and helpful for kiddos and many youth. I tell my kiddos and the young people I work with: Even on the darkest of days, we still believe that the sun will rise again. Even in the most desolate and bleak of circumstances, we always have hope. This is the gift of Good Friday. + Jesus is mocked and mistreated by the guards. How might we be comforted and encouraged by the cross and the experience of Jesus? + Simon of Cyrene was compelled to help Jesus carry the cross. Sometimes we don’t want to be a help to those in need. Why? How does Simon speak to us? + There were women who wept for Jesus. Sometimes we feel sad when we see the suffering around us. How do we find hope that brokenness and suffering will be transformed? Do you experience Good Friday with children and youth? What conversations does this day begin? I would really like to have a copy of the adapted Way of the Cross for children. Is it available anywhere? What a great post. I would also be interested in the adapted Way of the Cross for children – is this something we’re able to access? Thank you!